Broadsides for the Trump Era is a series of one-page, printable handouts commissioned by Historians for Peace and Democracy. Each broadside presents a brief summary and analysis of a moment in American history that informs one element or another of the Trump presidency. 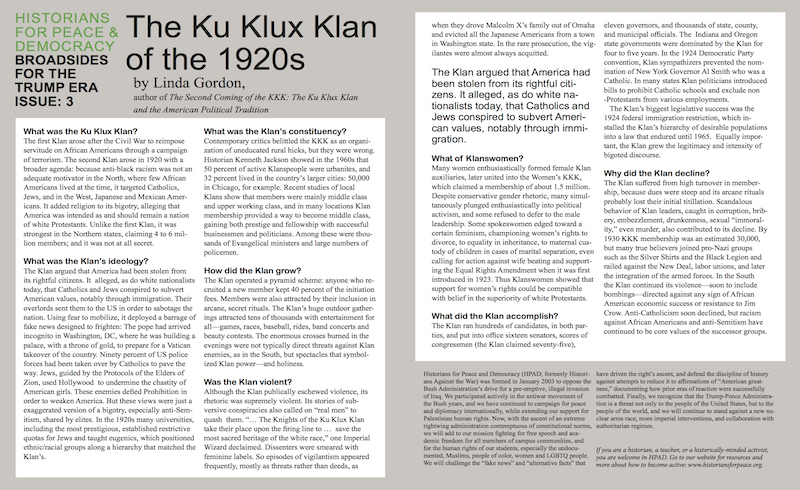 Click here to download Broadside #3: The Ku Klux Klan of the 1920s by Linda Gordon, historian and author of The Second Coming of the KKK: The Ku Klux Klan and the American Political Tradition. The first Klan arose after the Civil War to reimpose servitude on African Americans through a campaign of terrorism. The second Klan arose in 1920 with a broader agenda: because anti-black racism was not an adequate motivator in the North, where few African Americans lived at the time, it targeted Catholics, Jews, and in the West, Japanese and Mexican Americans. It added religion to its bigotry, alleging that America was intended as and should remain a nation of white Protestants. Unlike the first Klan, it was strongest in the Northern states, claiming 4 to 6 million members; and it was not at all secret. What was the Klan’s ideology? The Klan argued that America had been stolen from its rightful citizens. It alleged, as do white nationalists today, that Catholics and Jews conspired to subvert American values, notably through immigration. Their overlords sent them to the US in order to sabotage the nation. Using fear to mobilize, it deployed a barrage of fake news designed to frighten: The pope had arrived incognito in Washington, DC, where he was building a palace, with a throne of gold, to prepare for a Vatican takeover of the country. Ninety percent of US police forces had been taken over by Catholics to pave the way. Jews, guided by the Protocols of the Elders of Zion, used Hollywood to undermine the chastity of American girls. These enemies defied Prohibition in order to weaken America. But these views were just a exaggerated version of a bigotry, especially anti-Semitism, shared by elites. In the 1920s many universities, including the most prestigious, established restrictive quotas for Jews and taught eugenics, which positioned ethnic/racial groups along a hierarchy that matched the Klan’s. What was the Klan’s constituency? Contemporary critics belittled the KKK as an organization of uneducated rural hicks, but they were wrong. Historian Kenneth Jackson showed in the 1960s that 50 percent of active Klanspeople were urbanites, and 32 percent lived in the country’s larger cities: 50,000 in Chicago, for example. Recent studies of local Klans show that members were mainly middle class and upper working class, and in many locations Klan membership provided a way to become middle class, gaining both prestige and fellowship with successful businessmen and politicians. Among these were thousands of Evangelical ministers and large numbers of policemen. How did the Klan grow? The Klan operated a pyramid scheme: anyone who recruited a new member kept 40 percent of the initiation fees. Members were also attracted by their inclusion in arcane, secret rituals. The Klan’s huge outdoor gatherings attracted tens of thousands with entertainment for all — games, races, baseball, rides, band concerts and beauty contests. The enormous crosses burned in the evenings were not typically direct threats against Klan enemies, as in the South, but spectacles that symbolized Klan power — and holiness. Although the Klan publically eschewed violence, its rhetoric was supremely violent. Its stories of subversive conspiracies also called on “real men” to quash them. “… The Knights of the Ku Klux Klan take their place upon the firing line to … save the most sacred heritage of the white race,” one Imperial Wizard declaimed. Dissenters were smeared with feminine labels. So episodes of vigilantism appeared frequently, mostly as threats rather than deeds, as when they drove Malcolm X’s family out of Omaha and evicted all the Japanese Americans from a town in Washington state. In the rare prosecution, the vigilantes were almost always acquitted. Many women enthusiastically formed female Klan auxiliaries, later united into the Women’s KKK, which claimed a membership of about 1.5 million. Despite conservative gender rhetoric, many simultaneously plunged enthusiastically into political activism, and some refused to defer to the male leadership. Some spokeswomen edged toward a certain feminism, championing women’s rights to divorce, to equality in inheritance, to maternal custody of children in cases of marital separation, even calling for action against wife beating and supporting the Equal Rights Amendment when it was first introduced in 1923. Thus Klanswomen showed that support for women’s rights could be compatible with belief in the superiority of white Protestants. What did the Klan accomplish? The Klan ran hundreds of candidates, in both parties, and put into office sixteen senators, scores of congressmen (the Klan claimed seventy-five), eleven governors, and thousands of state, county, and municipal officials. The Indiana and Oregon state governments were dominated by the Klan for four to five years. In the 1924 Democratic Party convention, Klan sympathizers prevented the nomination of New York Governor Al Smith who was a Catholic. In many states Klan politicians introduced bills to prohibit Catholic schools and exclude non-Protestants from various employments. The Klan’s biggest legislative success was the 1924 federal immigration restriction, which installed the Klan’s hierarchy of desirable populations into a law that endured until 1965. Equally important, the Klan grew the legitimacy and intensity of bigoted discourse. Why did the Klan decline? The Klan suffered from high turnover in membership, because dues were steep and its arcane rituals probably lost their initial titillation. Scandalous behavior of Klan leaders, caught in corruption, bribery, embezzlement, drunkenness, sexual “immorality,” even murder, also contributed to its decline. By 1930 KKK membership was an estimated 30,000, but many true believers joined pro-Nazi groups such as the Silver Shirts and the Black Legion and railed against the New Deal, labor unions, and later the integration of the armed forces. In the South the Klan continued its violence — soon to include bombings — directed against any sign of African American economic success or resistance to Jim Crow. Anti-Catholicism soon declined, but racism against African Americans and anti-Semitism have continued to be core values of the successor groups.